This room has a new double bed, scandi drawers and wardrobe, full length mirror and shelves. Solid wooden floors, bedside matching drawers and bed side light make for a comfortable room for a couple. Access is directly off the entrance hall as is the private shower room with WC (bath and hand towels provided). We also offer a double room with a big round bed and en-suite, and a twin bedroom with private bathroom. These are listed separately on this site too. You can book all of them together through a fourth listing. Find them all easily by searching B&B Hove, UK on HomeAway. Please note that this is also our home; we have our own living space but we're on hand to point you to all the best places, transport and restaurants. We'll also provide you with a simple but beautiful breakfast - it's included! There's a choice of cereals or porridge, toast, croissants and jams, choice of a dozen teas and real coffee, and the best orange juice, all served at a time that suits you (but before 10.30am!). Please note that the boutique character of the space makes it better suited to adults. Earliest check in is 2pm and check out by 11am. Our guests love the convenience of the location, the quirkiness of the house and the peaceful surroundings. You can make your own hot drinks and we offer a dozen varieties of tea and coffee, all for free. You can store your cold drinks in the fridge. We love to chat to guests to make them feel at home but you have your privacy with your own funky lounge as well as your room. You'll have a key to come and go as you please and can access the gardens which are all around our detached property. We only have a few rules: We respect others' privacy and bed times and come and go quietly after 10.30pm. We leave the kitchen as we find it - pristine! Guests may make hot drinks and use the fridge but cooking is not permitted. Landline phones are not for the use of guests. Please, no outdoor shoes to be worn in the house. Groups should note that we don't allow partying or loud music even if you've booked all three rooms, sorry! Nor do we accept visitors who are not staying (unless by prior arrangement) or pets, and we're a smoke free zone. We have free broadband wi-fi and each room is equipped with a guide to the area and a bus timetable. We also offer an indie guide to hundreds of local small businesses and literature pointing you to local delights. Our children have flown the nest and now we have this super, big house all to ourselves. We've three spare bedrooms and bathrooms so it makes sense for them to earn their keep! So we do B&B at weekends only - and we've been thrilled at the enthusiastic response from our guests. We've been active for more than two years now and have welcomed guests from literally all over the world. Our eccentric home appeals for its hobbity exterior and its surprisingly chic and spacious interior - Tardis like, to Dr Who fans. Every room has its own bathroom, all are different in character, one even has a big round bed. 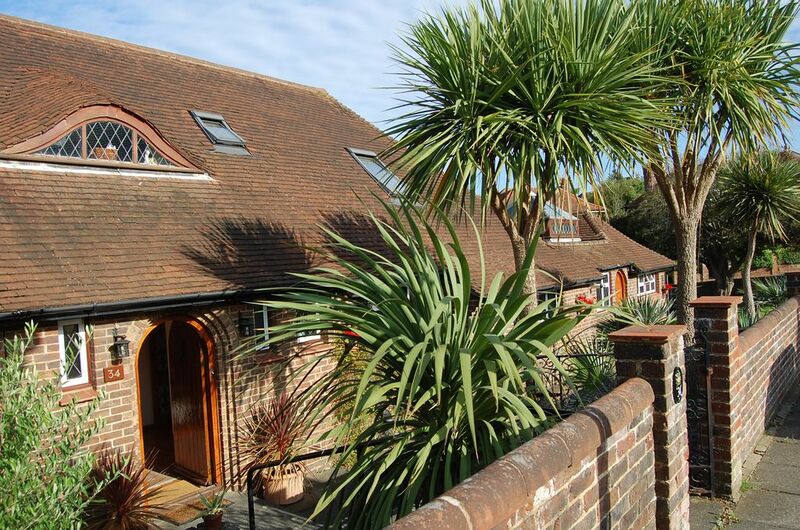 Character, peace, quiet and parking for free but only a mile from the sea and the sights of the city centre and not much further to the south downs and the Sussex countryside. Very few B&Bs can match our quirky eclectic mix of luxury and character. As this is our home our guests receive a sense of genuine hospitality. The double bedroom has its own modern, compact shower room; there is a white toilet suite, a new, white walk-in curtained shower, a small wash basin, a shaver point and peg for towels. Fresh bath towels are provided for each guest and there's a hand towel too. No land lines for guests' use. Yes, no washing up expected! Guests are welcome to use the fridge. Feel free to use the microwave to heat or defrost stuff. We'll manage this complex piece of kit on your behalf, or not, it's up to you. We'll serve breakfast at a time to suit you, let us know before you turn in. Some in your room but lots more in the 'library'. On all 4 sides. Guests are welcome to use. Guided cycling by prior arrangement plus 1 free bike; also free storage if you bring your own. Guests can help themselves to coffee and a wide variety of teas as well as use the fridge for keeping their own cold drinks. The house was perfectly situated for walking to our friends in Preston Park, even with a steep hill! The house was impeccably clean with a welcoming feel. Our double room was downstairs with sole use of a down stairs shower & toilet. The host, Geoff was on hand to answer any questions about getting out & about. The breakfast was served in the open plan kitchen, I enjoyed warm croissants and chose from an array of jam & honey. We were very impressed with the quality of the B&B: also the friendliness of the owners, their efficiency and the value for money. The house is close to the seafront and activities but in a quiet road and we had no trouble parking outside the property. Breakfast contained many choices and was fresh and very nice. We hope to stay there again in the future. Thank you both for a lovely stay. It was lovely to host you Danny. Come again any time! Sweet of you Sherron. We look forward to seeing you again! Our host and hostess were very friendly, welcoming and helpful. The accommodation was comfortable and very clean, very comfy bed. Breakfast was well presented and the choice was good. Thoroughly enjoyed our stay. Thank you. Nous avons passé 2 bonnes nuits chez Leslie et Geoff, très accueillants et très facilitants pour notre séjour. Nous recommandons ! Absolutely lovely place to stay! Staying for Brightons Vegfest, Geoff and Leslie were brilliant hosts, even going out of their way to purchase vegan milk for us! The Hobbit House was very clean and the bed very comfy, plus there was a variety of breakfast options, cereals, croissants etc. Highly recommend this B&B and it will definitely be the first place we look to book the next time we are in the area. Gee Max, you're so kind. No one will believe I didn't pay you to say that stuff!